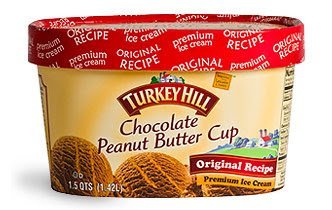 For a long time, my favorite flavor was Turkey Hill's Peanut Butter Cup Ice Cream. It's a nice chocolate between layers of peanut butter. and I don't mean little wussy layers, I mean real LAYERS, the kind where if you put your spoon under some of them, a huge chunk of peanut butter covered in chocolate comes out. Great peanut butter to chocolate ratio as well. It's been awhile, but I remember the peanut butter also having a nice texture, slightly salty, to give it a nice overall balance with the chocolate. If you've never had it, give it a try. Absolutely the best. I try not to buy it because I'll eat the whole thing in days. The only way it might be better is if they made a version with dark chocolate. Oh my gosh!!! I agree, it is great. And when my Kroger sells it for only $2.50, look out! I tried it and I had to stop eating it. It was definitely the worst ice cream I had ever had. The peanut butter was almost liquidy and tasted super salty and had a strong peanut butter taste. The chocolate part was alright I guess. I'm not sure if I got a bad batch or what. I love other turkey hill ice cream but this was really bit my favorite. the peanut butter swirl tasted like peanut butter? how annoying! sorry, couldnt resist, it was just too easy to nitpick. I use to love this ice cream with a passion but haven't had it in ages. The great part was how thick and solid the peanut butter swirls were compared to other companies offerings. Hope they didnt mess it up. Just tried this recently. It is excellent! The peanut butter is firm, salty and has a rich peanuty taste. The chocolate is a mild, milk chocolate flavor and the flavors are matched very well. I don't know if it changed since this was my first time eating it, but I will definitely be buying this again.